Samsung just released its latest flagship phablet, the Galaxy Note 9, in a bid to one-up Apple's iPhone X before the Cupertino tech giant unleashes a new smartphone lineup this fall. We put the Note 9 to the test. Samsung's Note 9 is very similar to past models in the line, and except for new cameras and a repositioned fingerprint sensor, it feels no different than the Galaxy S9 or Note 8. Our evaluation unit packs in 128GB of onboard storage and 6GB of RAM for $999, double the storage and system memory Apple offers with identically-priced iPhone X. A higher tier Note 9 with 512GB of storage can be had for a hefty $1,249, or $100 more than a 256GB iPhone X. On the inside, the Note 9 is packing the same Qualcomm 845 processor that's included in the Galaxy S9. It's an eight-core CPU that consists of four efficiency cores and four performance cores, running at up to 2.8GHz. By comparison, the iPhone X's Apple-designed A11 Bionic processor boasts six cores — four efficiency cores and two high-performance cores — running at a slightly lower clock speed of 2.39GHz. Both Note 9 models get the same Adreno 630 graphics chip as the S9 and S9+, which Qualcomm says is 30 percent faster, 30 percent more efficient and has 2.5 times the display throughput than the graphics chip in the Note 8. 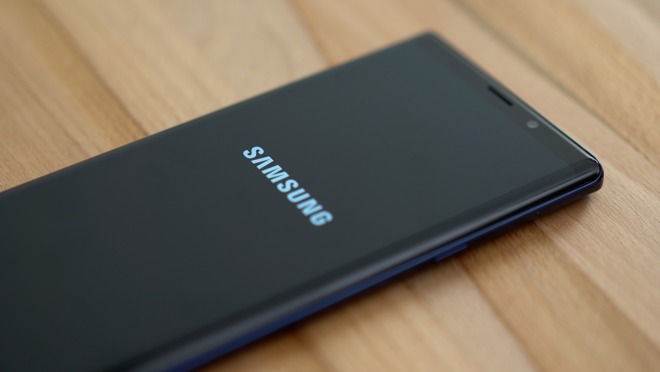 In addition to typical smartphone innards, Samsung incorporates a new water-carbon cooling system it claims prevents overheating. 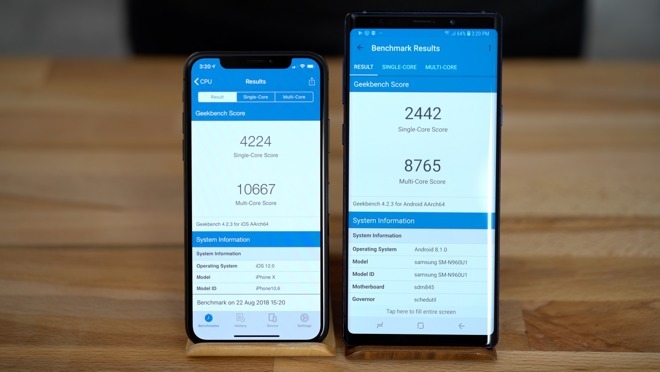 Moving on to benchmark numbers, the iPhone X completely destroys the Note 9 in Geekbench 4, especially in single core performance. 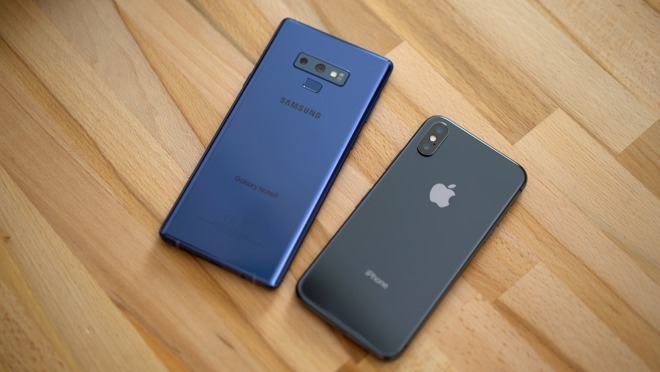 The iPhone came in with single- and multi-core scores of 4,224 and 10,667, respectively, while the Note 9 managed scores of 2,442 and 8,765. Interestingly, the Note 9's performance is an improvement over the S9+, which scored 2,007 and 8,307. 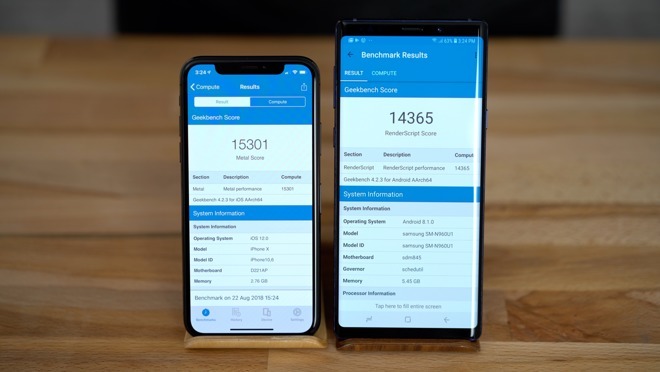 For Geekbench 4's graphics test, the Note 9 scored 14,365, only 57 points higher than the S9+, and very close to iPhone X's 15,301. 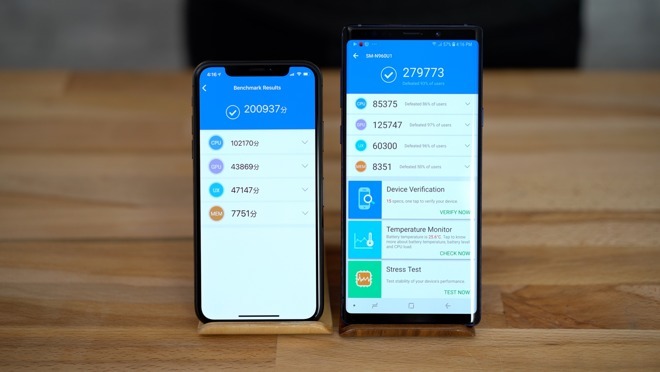 Moving on to the Antutu benchmark, the Note 9 actually beats out the iPhone by a good margin, with respective scores of 279,773 an 200,937. For Samsung, the boosted results are thanks to the massive improvements Qualcomm put into its graphics chip. It even scored a bit better than the S9+, which managed 263,661 points. 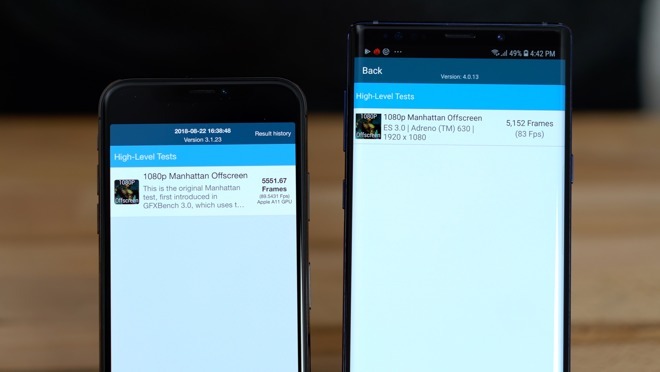 In Antutu's HTML 5 test, the Note 9's browser froze at the same point multiple times, but we suspect it would have scored similarly to the S9+ unit's 33,924 points. The iPhone X, on the other hand, scored 39,150 points. 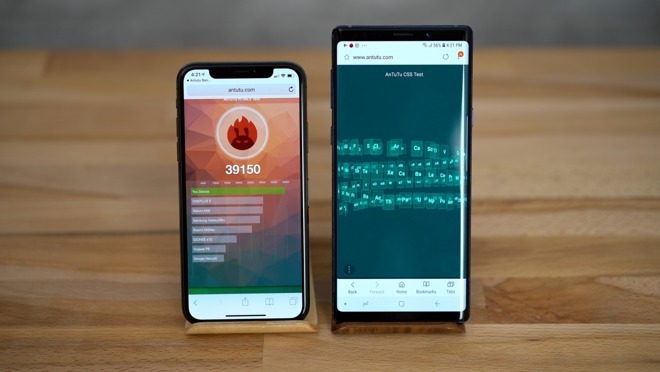 Octane 2.0, another browser benchmark, saw the iPhone X floor the Note 9 with scores of 36,714 to 20,194. For our final test, we ran GFXBench OpenGL's 1080p Manhattan Offscreen test. The iPhone X is slightly ahead with a score of 5,551, compared to 5,152 on the Note 9. The new Note eked out a slightly better performance compared to the S9+, which scored 5,106. Though it achieved higher marks better than the iPhone X in Antutu's 3D benchmark, the Note 9 is slower overall when compared to Apple's nearly year-old smartphone. In fact, the Note 9 is only a bit faster than the S9+. We will be conducting more testing with the new Note 9 in the coming days, including photo and video comparisons. Shoppers looking to purchase the Samsung Galaxy Note9 or iPhone X can take advantage of special offers at wireless carriers and electronics retailers. For those that want to purchase the Note9 outright, B&H Photo is offering customers a free Samsung DeX Pad Dock and Qi Wireless Charger Duo valued at up to $218.99. The phone itself qualifies for free expedited shipping — and B&H will not collect sales tax on orders shipped outside New York and New Jersey. Wireless carriers AT&T and Verizon are also offering buy one, get one free promotions on the 128GB Note9. For iPhone X buyers, T-Mobile and AT&T are offering $700 off a second iPhone X with qualifying plans and conditions. The devices are also available on eBay, often at a discount.